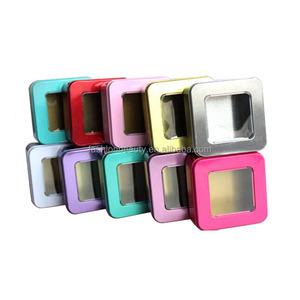 small cosmetic tin with pvc window Product name small cosmetic tin with pvc window Description two piece tin with hinge and pvc window on the lid, used for cosmetic Specifications Product size: 142*84*14Hmm Any of your own design can be printed on the tins. Hinged design Printing CMYK printing on outside of round tin box it can be different according to your request Surface finish Varnish / Matt varnish, Embossing and Debossing are all achievable Price Depends on size, material, printing, after-printing finishes, quantity and packing. For ten years we insist on high quality and service as the core of our culture and win us good reputation in the market, so far we have built steady cooperation with Disney, Coca cola, Target, Carrefour, Mars, Lindt and some other prestigious company, we really hope you can join in us and grow with us. Rectangular tin box cosmetic tins with clear window top 1. 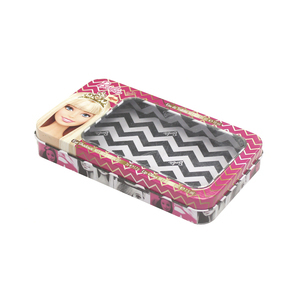 Features: Rectangular tin box cosmetic tins with clear window top ITEM NO. Packaging boxes: biscuit tin, chocolate tin container, tea/coffee cans, cosmetic box, condom box, wine packaging cans, tin pencil box,small metal tin box, tin gift card box etc. 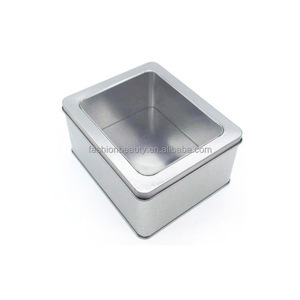 , LTD is professional tin manufacturer with 10-year experience of producing and exporting of various kinds of tin boxes with high quality and competitive price in China. 2. Any color can be made according to the pantone color or your requirment. 3. Professional packaging or accpet customized. 4. Provide samples and custom samples for your checking.